Finding material in Japanese that is just right for you as a beginner to the language can be pretty tough. 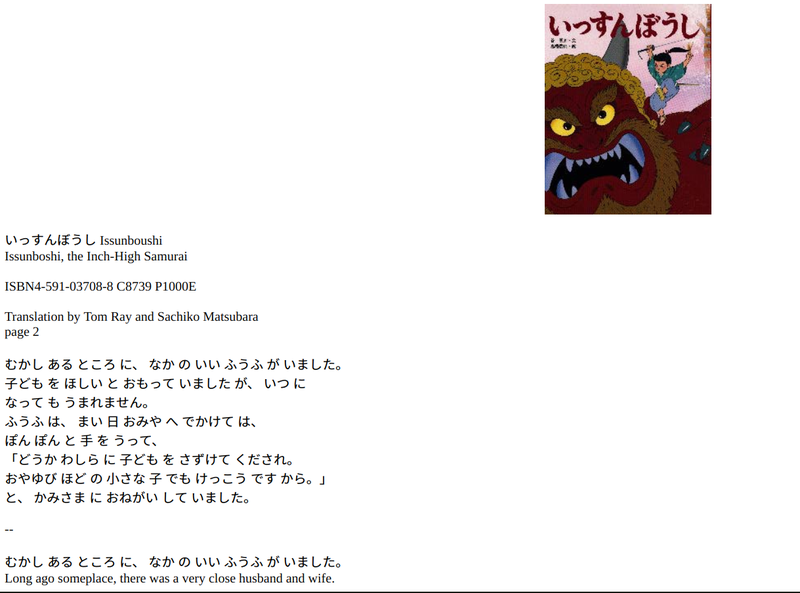 Fortunately, children’s stories are a good place to start learning from in any language and Japanese is no different. Why use children’s stories to study Japanese? The vocabulary and grammar used are limited and therefore simple. Stories are designed to be fun and engaging without being too difficult to follow. There are plenty of pictures to assist with the understanding of the story. Sentences to be repetitive, which helps learners to identify common sentence structures. They are short and therefore relatively quick to read. On the other hand, there can be some unexpected difficulty with children’s stories. A lot of books for children have fantastical elements and are often not as straightforward as they seem. With Japanese, a lot of the children’s stories I have tried reading had lots of onomatopoeia. This is something rarely covered in beginner’s Japanese classes in my experience. In addition, having sentences entirely in hiragana might look easier to tackle, but actually parsing the sentence can be tricky. Beginner’s Japanese textbooks are likely to put spaces in between hiragana words to avoid this issue. However, Japanese children’s books beyond those aimed at younger children will not have spaces. Despite the potential difficulty, I still recommend children’s stories as the best way to get reading in Japanese. Children’s stories are widely available online for free, and there is bound to be a story that you enjoy. Should I study Japanese stories or stories from other parts of the world? In my opinion, the answer to this question is to study both! It is easier to start off learning stories that you are already familiar with. You will be able to fill in any gaps in your language knowledge from context. Japanese versions of popular children’s stories such as Little Red Riding Hood (Japanese title: 赤ずきん) and Cinderella (Japanese title: シンデレラ) available to read through the resources listed further on in this post. Without prior knowledge of the stories, these will be harder to follow for Japanese learners. I recommend trying to read these stories (in Japanese or otherwise) if you can in any case. They provide an interesting insight into Japanese history and folklore and are often referenced in TV shows and other media. I’ve put together a list of some of the best (mostly online) resources Japanese learners can use to study children’s stories below. …will bring up children’s picture books and stories in Japanese. One of my favourite youtube channels for Japanese children’s stories is called キッズボンボンTV (Kizzu Bon Bon TV). THis channel has many many videos covering popular stories with Japanese subtitles. There are no English subtitles but there are English versions available for most stories and relevant links are always in the description box. There’s also a channel called Japanese Fairy Tales, which has Japanese audio and English subtitles on its selection of stories. Beelinguapp is an audiobook app that has lots of traditional children’s stories from around the world in many languages including Japanese. The app highlights the sentence being read, which makes it easy to follow the audio. Most children’s stories are available in the public domain, which means there are audiobooks available for free. Librivox is a website where you can get free audiobooks in many languages as well as Japanese. These audiobooks tend to be stories for which you can find the texts on Aozora Bunko. 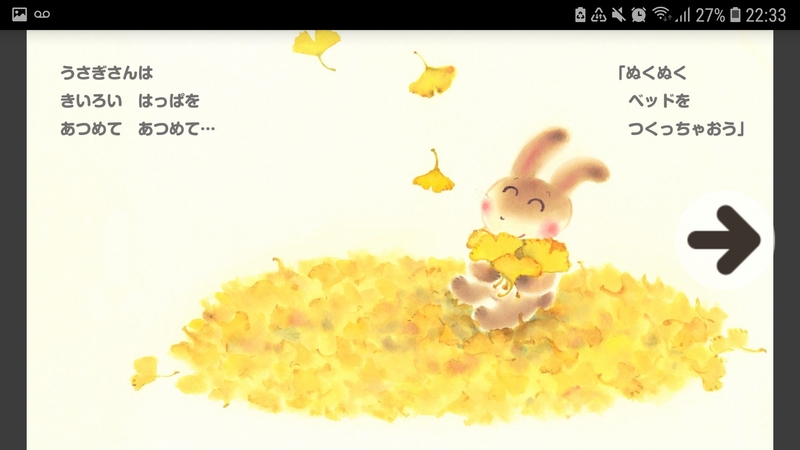 Google Play has recently added a small selection of Japanese audiobooks for children to its catalogue. Examples of the audiobooks I have found include a series called いっしょに楽しむ　にほんむかしばなし (issho ni tanoshimu nihon mukashibanashi), a series called エルマーのぼうけん (erumaa no bouken) and あなうさピータ (anausa piita – ie. The Tale of Peter Rabbit by Beatrix Potter in Japanese). I haven’t been able to try any of these out for myself yet. I have listened to the free samples and they appear to be of pretty good quality. Costs range between £4 and £8 per audiobook. You can buy physical Japanese books from a variety of online stores, most of which I have outlined in my Tadoku post. The below list is focused on places to read Japanese stories online. Tom has translated some of the most famous Japanese children’s stories as part of his own Japanese studies. Luckily for us, he shared them on his website for other Japanese learners to make use of. I recommend this site as it gives the furigana for any kanji used, has a vocabulary list for key phrases and breaks down the translation of each sentence. Hukumusume is a Japanese website full of children’s stories from Japan and around the world. 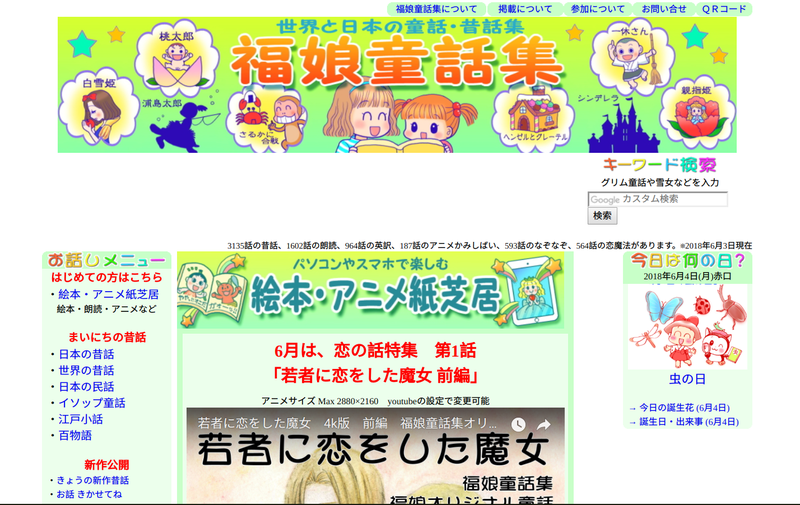 I’ve written about this website in my Japanese Reading Resources for beginners (Part 2) post. There aren’t any English translations, so it is a good idea to start off with a story you are already familiar with. I recommend reading Hukumusume stories through the wonderful TangoRisto app, which makes looking up unknown words a breeze. Aozora is a well known free resource that has a huge catalogue of children’s stories in Japanese. In order to find them on the website you need to click on 分野別リスト on the main page and then look for ”童話書” (children’s stories). From this page you can select　”９　文学” to find the list of children’s literature, split by country of origin. If you are looking for Japanese versions of a story you are familiar with, it is best to search for it in Wikipedia and then switch the page language to Japanese in order to find the Japanese title. Obviously, there are many more Japanese stories that international ones on this website. I have written before about children’s stories by famous Japanese authors such as Niimi Nankichi, Ogawa Mimei and Yumeno Kyusaku which are particularly great choices for Japanese learners to use. I’ve singled out the Amazon Kindle store in this particular post as I have found the Amazon Kindle store in my country (the UK) has a collection of children’s books in Japanese, which can be purchased and read without any need to sign up to an Amazon JP account. From the Kindle Store homepage in Amazon, go to ebooks in foreign languages section and select Japanese. The Amazon UK store also has a children’s book section, making things even easier! Not all of the results tend to be 100% relevant so make sure to take advantage of any reviews you can find. Most books are £1-£3 each so are pretty cheap. Take advantage of reading a sample so that you can assess the quality of the ebook before making any purchases. Graded readers aimed at Japanese schoolchildren are available which tend to cover popular stories, but may also be focused on non-fiction topics. These books are normally divided into difficulty according to elementary school years and come with furigana readings for any kanji used. Popular series include １０分で読めるお話 (juppun de yomeru ohanashi) for fiction and なぜ？どうして？(naze? doushite?) which covers non-fiction topics. I have the 2年生 version of １０分で読めるお話 as pictured above, which is a mixture of Japanese stories, non-Japanese stories and even a couple of poems. In addition to furigana, there are spaces between words and pictures every few pages to make the stories more manageable. This makes them good choices for those studying Japanese, even if it might take you a bit longer than 10 minutes to finish! I would start with the 1年生 (ichi nensei) stories aimed at Japanese children in their first year of elementary school. You can then work your way upfrom there if that is too easy for you. These books are available in both ebook and physical book format from places like Amazon and eBookJapan. 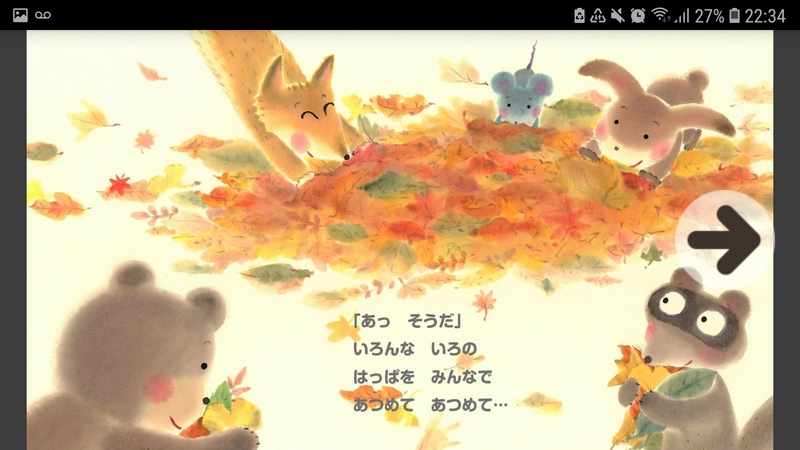 PIBO touts itself as an ‘all you can read’ app for Japanese children’s picture books. The app is entirely in Japanese but is super easy to use even if you do not know much Japanese yet. From the main page of the app, you get a choice of a selection of children’s books which change on a daily basis. The free version of the app gives you access to read up to 3 books per day. These books range from children’s classics to contemporary stories. PIBO promises high-quality picture books and this is certainly the case. Colours are vivid and bright, even on my mobile phone (it would be much better to read on a tablet of course). The stories are mostly aimed at children between the ages of 3 and 6. All of the stories I have read were entirely in hiragana with spaces between words. The great thing about PIBO is that all stories come with the option to listen to the audio which is also high quality and great for Japanese study. The app is free to download from the Apple App Store or Google Play Store. A full subscription costs £3.89 a month, which gives you access to the full library of 300+ books but I think the free subscription is sufficient for those learning Japanese. Once you’ve become comfortable with reading books aimed at younger children, consider looking into books aimed at older children and young adults. Series of books aimed at older elementary age children include 角川つばさ文庫 (kadokawa tsubasa bunko) – these usually come with furigana over kanji used and are intended to be easy to read. A wide range of books are published under this label, including adapted versions of classic Japanese literature, foreign books/ films and original stories. When tackling longer texts for the first time, consider reading translations of stories you are already familiar with to avoid getting overwhelmed with too much information. For example, the whole of the Harry Potter book series is available on the UK Amazon Kindle Store in Japanese. There are also books aimed at Japanese children which can be appropriate for Japanese learners. 魔女の宅急便 (majo no takkyuubin – also known as Kiki’s Delivery Service) by Eiko Kadono is a popular children’s book that is fairly easy to follow. This is even easier if you are familiar with the Studio Ghibli film adaptation! Other Japanese authors that I know of that write children’s and young adult fiction include Eto Mori, Hoshi Shinichi, Miyazawa Kenji, Mutsumi Ishii and Masamoto Nasu. Otherwise, I suggest asking Japanese friends and thinking about what kinds of books you read in your native language. Then try to find something similar in Japanese. Websites like Bookwalker allow you to read samples, so make use of this as much as possible before choosing a book. Reading reviews on Amazon Japan is another method of testing your reading skills . You can also understand what to expect from a book before buying anything. I follow the tadoku approach to reading in Japanese, so even if I get a book and don’t enjoy it, I just move on to something else. I would really like to put together some posts on first novels in Japanese at some point to add here so watch this space! This turned into a much longer post than I was expecting. I hope you find this post useful if you are looking to dive into children’s stories. If there is a resource that I have missed off this list, please let me know in the comments. What a great collection of resources! I’m definitely going to check out １０分で読めるお話. I’m glad you like it 🙂 I’ve only recently come across this series myself because I wanted to read more short stories! I live for the PIBO App. When I have extra time sometimes I just listen through the stories then try tackle reading along. Great reference! Thanks for commenting 🙂 I have had PIBO installed on my phone for the longest time but I had forgotten how great a resource it is until recently! Thanks Julia, I am glad the post helps – it feels like it took forever to write, but I wanted this to be a comprehensive post (which I will update if I find anything else useful)! Wow! Such a comprehensive list! Looking forward to digging into some of these. I think following a narrative might give me a bit more of a hook to keep practicing more. I agree – it is much easier to keep motivated when you’re trying to read a story where you genuinely want to know what happens next. I just released a book of classic Japanese children’s stories translated into English. The stories are listed in parallel English/Japanese to aid in those who want to use them to practice reading in Japanese. Also, most of the stories in this collection have never been available to an English-speaking audience before. That’s great! I only discovered Ogawa a few months ago, and thought it was a shame that his works are not better known.